An online backlash over a supposed “happy hour playset” for kids has proven to be misplaced since the item in question doesn’t exist. After a Facebook user posted a photo Tuesday that showed the set – complete with bar stools, plastic bottles and featuring what appeared to be the Fisher-Price logo – people began to post messages on the company’s social media pages condemning the product. 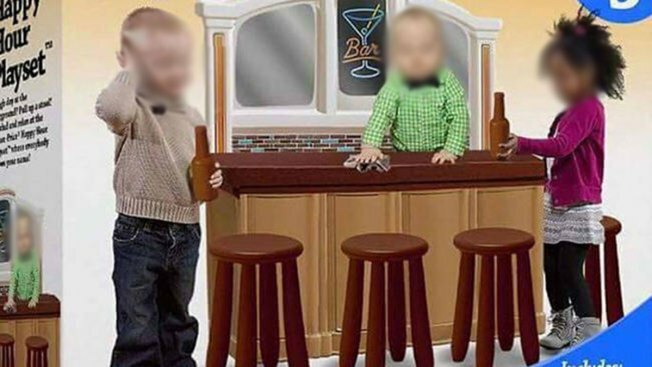 The box featured three toddlers, two holding bottles while a third appearing behind the bar. The hoax debunker website Snopes.com investigated the item and found that it isn’t real.